I recently took a trip to Nashville. While there we ate at the Wild Cow. Its an all veg restaurant, and we were really looking forward to it. Overall, the food was just ok… But, I ordered the Buffalo Tofu bowl, and I have to say, that was definitely the stand out meal. It was delicious. It made me think that I should make something similar at home. And it turned out EVEN better than what I had there, in my opinion. What you have here is a bowl of brown rice, red beans, steamed kale, avocado, and buffalo tofu. I served it with a side of cornbread. mix items together and blend until smooth and creamy. I make my seitan from Vegan eats world. This is my go-to recipe! I make it in 2-3 batches and freeze it and keep it on hand. Its really easy and delicious. 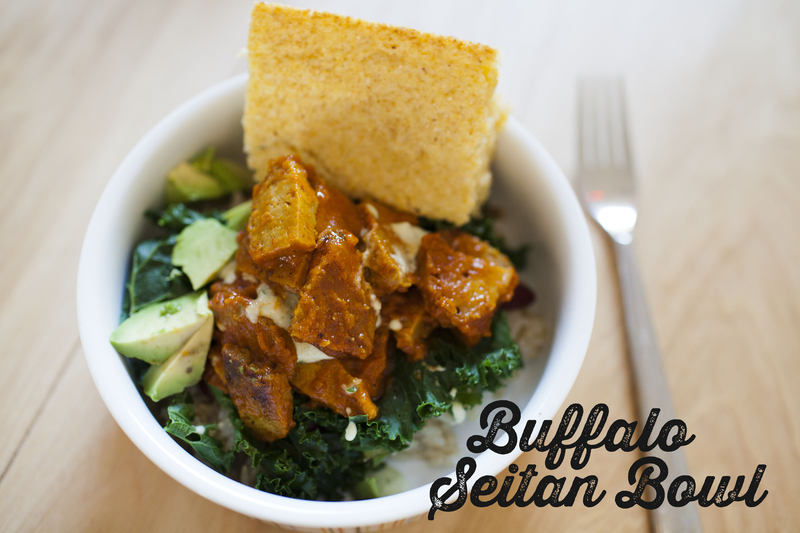 Use your favorite seitan for this, and cut it into chunks. Chop your seitan and coat with 2 tsp garlic powder, 1 tspn oinon powder and 1 Tbsp cornstarch. Saute in a pan until starting to brown. In a bowl, melt 2 Tbs Earth balance. Mix in 1/2 cup of Hot sauce (we prefer franks!) and mix well until combined. Add this to the pan, and let sizzle for 30 seconds to a minute. Remove from heat. In the meantime heat up your beans, and steam your kale and prepare your ranch dressing. Layer a bowl with rice, beans and kale. Then top with avocado, seitan and drizzle some ranch dressing on top. enjoy! Peaches are in season! 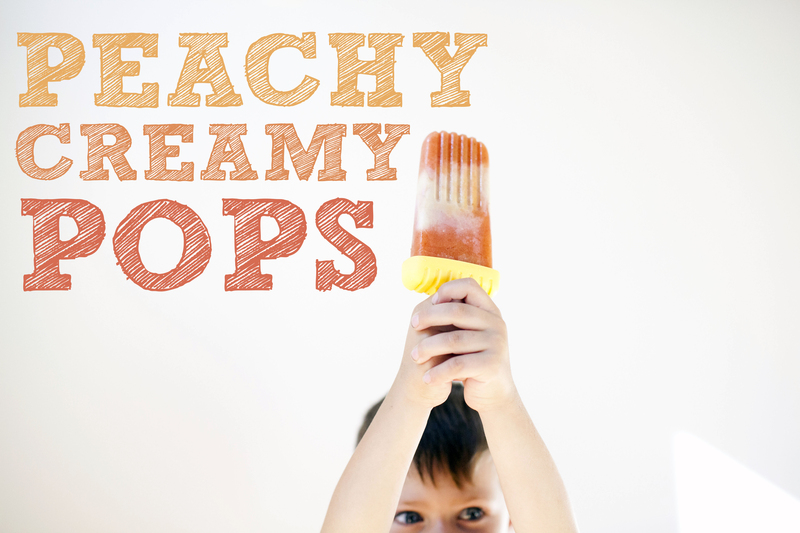 And thanks to these pops, my little guy discovered he loves peaches. He helped me make these delcious popsicles Saturday morning and then kept asking for peaches the entire weekend. I found the recipe for these here. 2. Peel peaches and roughly chop. Place in a high-speed blender and blend until completely smooth. Add 1 tablespoon of liquid sweetener if desired. Pour contents into a container with a spout and set aside. 3. Give your blender a quick rinse and add the cashews, along with the vanilla bean, 2 tablespoons of sweetener and water. I also added about 1-2 Tbsp. Almond milk to help get this going a little bit further. Blend on high until completely smooth. 4. Into each popsicle mold, pour a small amount of either the peach puree or cashew puree, then alternate between the two until you’ve reached capacity. Using a popsicle stick or skewer, stir the liquids together slightly to create a marble effect. Place a popsicle stick in each mold and place in the freezer until completely frozen. To remove, run the mold under warm water until the popsicle easily slides out. Enjoy! Again, Sorry for the slience. The end of summer has caught up with us. I have some projects planned – hoping to get out this weekend to get supplies and maybe even start crafting away. I showed some of the ideas to milo last night and he’s really excited to get moving as well. So stay tuned – sorry for the absence, and thanks for keep following along! 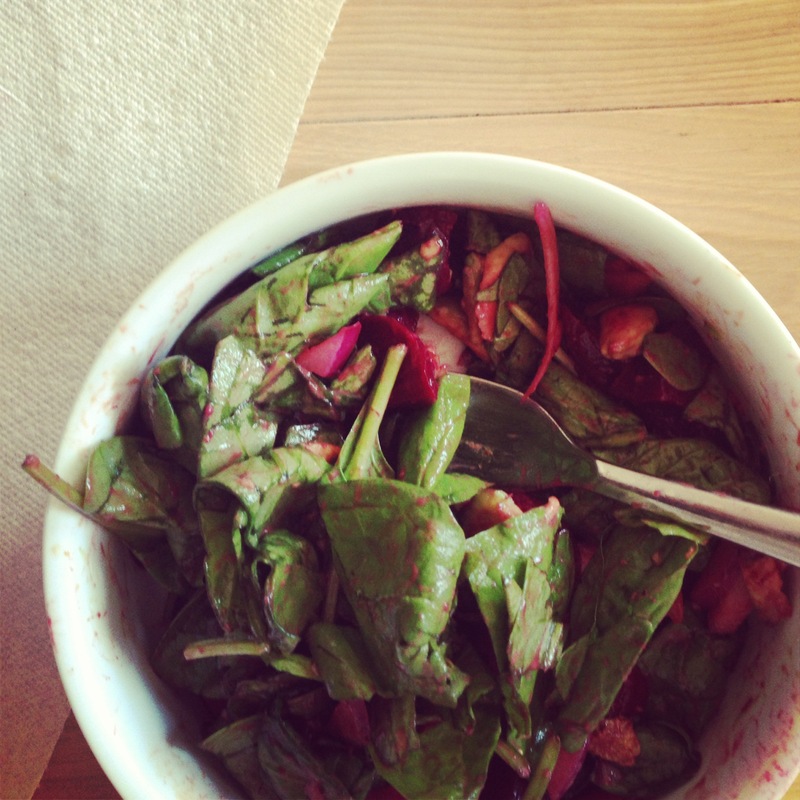 spinach salad with beets, avocado, onion and pistachio. So now that I’ve confessed my love for beets, here’s another combo that rocked my socks off. I had harvested and roasted some beets this weekend, in anticipation to make these again, and just havent had a chance to do so. Those beets were just sitting in the fridge taunting me. Today for lunch I was determined to make a salad with them using things I had on hand. I came up with this delicious salad! Shake well and add to salad. I only used a little bit of dressing, so use what works for your taste level. I swear, next year, I’m going to save about half my garden space just to grow beets. I can NOT get enough of them! So guess what? 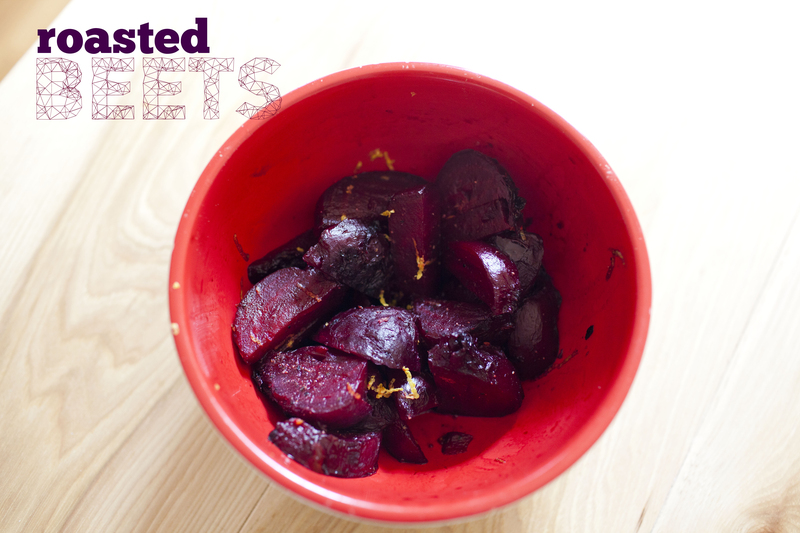 I have another mad love affair…this time with beets! I’ve learned to accept beets in my life by masking the taste. I started with juicing, and now Im addicted to having them in my juices. Ive baked with them, made burgers with them….. Fine by me, as long as there is something else to mask the beet-y, dirt-ish flavor. Baby steps, but I have come around….Now I can’t get enough of their deliciousness! I planted lots of beets in my garden this year, with the intention to juice them. Not sure how many of these are actually going to get into the juicer now that I’ve learned about roasting them. Sure, they take a bit of time to roast – but I promise you, its well worth it. No dirt taste here. I find myself craving these days afterwards. I just want more beets! And bonus: beets are EXTREMELY healthy for you! They contain Potassium, magnesium, fiber, phosphorus, iron, vitamins A, B & C, beta-carotene, beta-cyanine AND folic acid! SUPERFOOD! Let me know your favorite way to eat beets!